ARLINGTON, VA; March 26, 2014 -- PBS and WGBH announced today the final national ratings for hit dramas “Downton Abbey, Season 4” and “Sherlock, Season 3” on MASTERPIECE. An average audience of 13.2 million viewers tuned into PBS member stations for “Downton Abbey, Season 4,” reinforcing its status as PBS’ highest-rated drama in history (and up from 11.5 million viewers for Season 3). The average audience for “Sherlock, Season 3” grew to 6.6 million viewers in its new 10 p.m. timeslot — up from 4.4 million viewers in Season 2. Sunday nights continue to grow for PBS stations with Sunday average primetime household ratings up 30 percent since the 2012-2013 season. 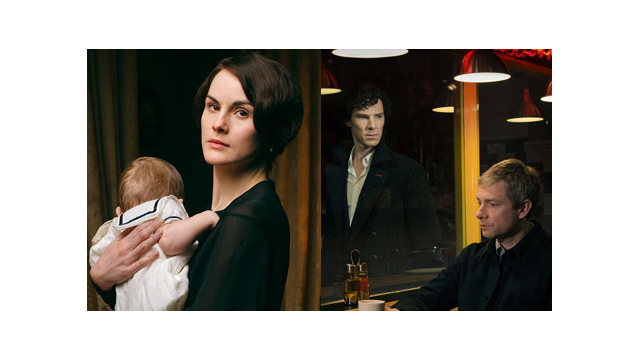 A strong lineup of British dramas continues throughout the spring, including the premieres of CALL THE MIDWIFE (Season 3), MASTERPIECE “Mr. Selfridge, Season 2” on March 30 and THE BLETCHLEY CIRCLE (Season 2) on April 13. The fourth season of “Downton Abbey, ” a Carnival Films/MASTERPIECE co-production, is now the highest-rated drama in PBS history, outperforming the drama’s record-breaking third season for the top spot. Per Nielsen, the eight-week season earned an average national household rating of 8.5 — up from Season 3’s 7.7 national household rating — and 26 million viewers tuned in over the course of the season. According to Social Guide Intelligence, on Sunday nights across its run, “Downton” generated more than 280,000 tweets and more than 35.6 million impressions while facing stiff social media competition, including the Golden Globes, the Olympics and Super Bowl XLVIII. Numbers for “Sherlock” were dynamic across its third season, with an average audience dramatically higher than the PBS average audience in the 10:00-11:30 p.m. timeslot. The third season of the drama, a Hartswood Films Production for BBC/Cymru Wales co-produced with MASTERPIECE and distributed by BBC Worldwide, improved upon the second season in all areas, notably in its 4.1 national household rating, which was a 46 percent increase from a 2.8 rating for Season 2. The average audience improved 50 percent to 6.6 million, and the 13.5 million total viewers reached increased 26 percent from 10.7 million in 2012. On Sundays across its three-week run, “Sherlock” fans produced more than 58,000 tweets and generated nearly 4 million impressions against programming including the Grammy Awards, NFC Championship Game and Super Bowl XLVIII. (Source: Social Guide Intelligence). While PBS member stations remain the strong first place for series viewing, there were 11.1 million streams of full episodes of “Downton Abbey, Season 4” and 3.3 million streams of full episodes of “Sherlock, Season 3” across desktop, mobile and PBS apps on Roku, XBox and Apple TV. Online viewers are increasingly consuming content on PBS mobile apps and over-the-top devices, which accounted for almost half (46%) of the total streams for each program. The MASTERPIECE website also saw increased traffic during “Downton Abbey” and “Sherlock” broadcasts, with more than 10.1 million unique visitors making 22.2 million visits to the site in January and February (Source: Google Analytics). With an award-winning portfolio of drama and comedy, Hartswood Films prides itself on being a truly independent production company. Founded by Beryl Vertue in the 1980s, she was subsequently joined by Sue Vertue and Elaine Cameron as Producers, and Debbie Vertue as Director of Operations. The company’s award-winning dramas include “Sherlock” and “Jekyll” for BBC1, and “The Guilty” for ITV1. Outstanding comedy including Simon Nye’s multi-award-winning “Men Behaving Badly,” Steven Moffat’s “Coupling” for BBC2 and more recently “Me and Mrs Jones” for BBC1 and “Edge Of Heaven” for ITV1. In 2010 Hartswood opened Hartswood West, a dedicated Nations and Regions office operating from Cardiff. WGBH Boston is America’s preeminent public broadcaster and the largest producer of PBS content for TV and the Web, including Masterpiece, Antiques Roadshow, Frontline, Nova, American Experience, Arthur, Curious George, and more than a dozen other prime-time, lifestyle, and children’s series. WGBH also is a leader in educational multimedia, including PBS LearningMedia, and a pioneer in technologies and services that make media accessible to deaf, hard of hearing, blind, and visually impaired audiences. WGBH has been recognized with hundreds of honors: Emmys, Peabodys, duPont-Columbia Awards, and Oscars. Find more information at www.wgbh.org.